Last week, after making a pot of mushroom barley stew, I wanted to bake something to have with it. My first thought was biscuits and then I switched my thinking to corn bread, and finally settled on some whole wheat muffins. I had made some savory whole wheat muffins to have with some dinner at some point in the past, but I couldn't remember what recipe I used. 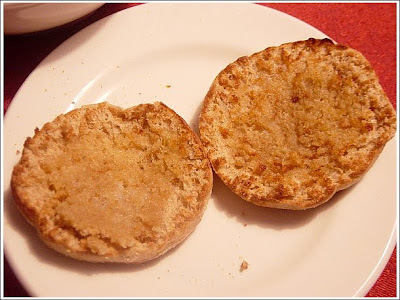 The internet turned up quite a few options, but it was this recipe for whole wheat English Muffins that caught my eye. Having wanted to give English Muffins a go for quite a while, I figured there was no time like the present (which I guess is now the past), and set to work. About 3 hours later, I was pulling my first muffins off of the griddle and was quite happy with the results. The muffins looked good, tasted even better, and after a quick fork-splitting, had all the requisite nooks and crannies. If you've got a few hours on your hands, give this one a go. I did make a few minor alterations to the recipe as written. First and foremost, I substituted instant yeast for the dry yeast called for. Because of the way it's produced, instant yeast can be mixed directly into flour without proofing first in water. 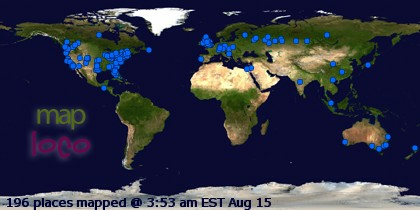 I find this to be quite convenient, and I'm sure you will too. If you're going to do any significant amount of bread baking, I highly recommend picking up a pound of SAF Instant Yeast (which can be stored in your freezer, and will last for months). I just made sure to add an extra 1/4 cup of water to the wet ingredients in the recipe (since I didn't have to proof the yeast). Second, I wanted my muffins to be 100% whole wheat, so I subbed 1 cup of white whole wheat flour for the white flour. Third, I added the wet ingredients to the dry all at the same time, mixed until the flour was moistened, and then did the kneading with my Kitchen Aid. Start by mixing the dry ingredients, and then the wet, in separate bowls. As Alton Brown would say, add the wet team to the dry team. Mix everything until the flour is moistened, then knead either by hand or by mixer. I mixed on speed 2 in my Kitchen Aid for 4 minutes, allowed a 5 minute rest, then gave it 4 more minutes. If your kneading by hand, I'd probably go about 10 minutes (and try to resist the urge to add too much extra flour, the dough should be a bit sticky). Round the dough into a ball, place in a lightly oiled bowl covered with plastic wrap until doubled in size. The tip in this recipe about using the microwave and a cup of water to create a warm, moist place for the dough to rise is an excellent one that I've used many times with great success. Give it a try. Punch the dough down and roll it out about 1/2 inch thick. Cut into 3 inch rounds. After all the dough is cut, cover the rounds with a damp cloth and allow them to rest for 20 minutes. Begin preheating a griddle or large nonstick skillet over medium/low heat. 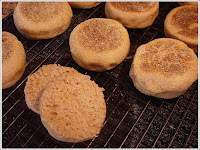 The most interesting aspect of making English muffins is the fact that they are not baked, but cooked on a griddle. This gives a distinctive browned top and bottom with a tender, soft middle to the cooked muffin. The trick is to have the pan just hot enough to brown the top and the bottom in about 8 to 10 minutes (5 minutes on first side, 3-5 on second side), and cook the muffin through the middle. If the heat is too low, they won't cook properly, and if the heat is too high, the top and bottom will brown (and burn) before the middle is cooked through. As the recipe says, you may sacrifice the first few while you get used to the cooking process. Sprinkle some corn meal on the griddle and place a few rounds on the pan. Cook for 5 minutes then flip and cook for 3 to 5 additional minutes. Remove to a rack and cool completely. If you want the aforementioned nooks and crannies, split the muffins with a fork. Toast, top as you like and enjoy! These went great with the stew, and the few that I had leftover froze beautifully. Just split them before you freeze them, then just pop one or two in the toaster whenever you need a warm, toasty muffin.